Food related endeavors that focus on community development and engagement — from community gardens and urban farms to workforce development programs — play an essential role in enhancing food security, educating citizens about where there food comes from, and strengthening food equity. Robert Egger is the Founder and President of L.A. Kitchen, which recovers locally sourced, cosmetically imperfect fruits and vegetables to fuel a culinary arts job training program for men and women coming out of foster care and older men and women returning from incarceration. Founded in 2013, L.A. Kitchen is now located in a 20,000 sq. 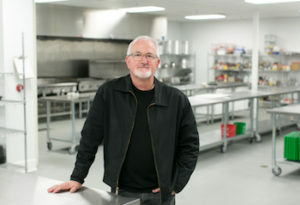 ft., two–level processing kitchen, located in NE Los Angeles. L.A. Kitchen operates Strong Food, a wholly owned, for-profit subsidiary that hires training program graduates and competes for food service contracts, with an emphasis on opportunities to serve healthy senior meals. L.A. Kitchen’s founding partner is the AARP Foundation, which gave its first million dollar grant to help establish the model. L.A. Weekly named Robert one of their 2016 People of the Year, and in 2015, he was given the Conscious Leader of the Year award by Conscious Capitalism. He was included in The NonProfit Times’ list of the “50 Most Powerful and Influential” nonprofit leaders from 2006-2009. He was the recipient of the Restaurant Association of Metropolitan Washington’s 2007 “Lifetime Achievement” award and the 2004 James Beard Foundation “Humanitarian of the Year” award. Robert has also been named an Oprah Angel, a Washingtonian of the Year, a Point of Light, a Food Hero by Food Tank, a REAL Food Innovator by the US Healthful Food Council, and one of the Ten Most Caring People in America by the Caring Institute. He is also a 15-gallon blood donor to the American Red Cross. Limited Tickets Remain; REGISTER NOW! 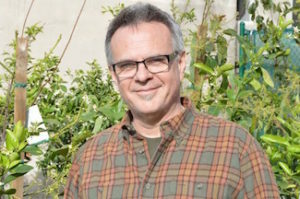 Tim Alderson is the Executive Director of Seeds of Hope, the food justice ministry of the Episcopal Diocese of Los Angeles, which grows and distributes food in over 100 communities of need across six Southern California counties. Tim Alderson is the Executive Director of Seeds of Hope, the food justice ministry of the Episcopal Diocese of Los Angeles, which grows and distributes food in over 100 communities of need across six Southern California counties. His lifetime in agriculture has included nearly 20 years as CEO of AgriGator, Inc., a multi-national soil amendment manufacturer, as well as numerous industry boards including the board of directors of the National Agri-Marketing Association. He was the founding chairman of the California School Garden Network and was appointed by two California governors to the board of the Schools Agriculture and Nutrition Program where he currently serves as President. He was also appointed to the California Department of Education School Garden Advisory Committee. Tim lives in Pasadena, California where he has served as Chairman of the city’s Recreation and Parks Commission and the Mayor’s Workforce Housing Task Force. Julie Beals is Executive Director of the Los Angeles Community Garden Council, which manages 40 community gardens and offers advice, workshops, and community organizing assistance to more than 125 community gardens in Los Angeles County, serving more than 6,000 families. Julie Beals is the Executive Director of the Los Angeles Community Garden Council. The Los Angeles Community Garden Council manages 40 community gardens and offers advice and workshops to more than 125 community gardens in LA County. It is a rapidly growing non-profit organization that enables people to grow fresh, organic fruit and vegetables in their neighborhood. The organization encourages healthy lifestyles while also teaching gardening skills, supporting cross-cultural and inter-generational relationships, creating jobs, building resilient communities, and reducing crime in neighborhoods. 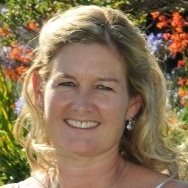 Julie is a marketing, communications, and development professional. She worked for international book publishers in the UK, Switzerland, and Boston for six years before moving to Los Angeles in 1998 to attend graduate school at USC. She was a Marketing Manager and Director at Warner Bros. Home Entertainment for six years, working on worldwide brands including Harry Potter, Scooby Doo, and American Girl. In 2007, she moved to the non-profit sector where she served as Director of Institutional Advancement for St. James’ Episcopal School and Senior Manager of Donor Relations for the Girl Scouts of Greater Los Angeles. Julie has served on the board of several non-profit organizations including the Dorcas House foster home in Tijuana, Mexico. Julie’s passion for social and economic justice is the driving force behind her work building and supporting community gardens throughout LA County.